In 1989, Anastacio, one of the Rodriquez-Ibarra brothers started working as a kitchen helped at Italian Delight Pizzeria, a Satiro’s family business in Narberth, Pennsylvania. After several months, Anastacio called his brother Juan with a job opportunity. Several years later, another brother, Marco Antonio, called on his brothers with an opportunity to go work with him at A & M Pizza in Lebanon, Pennsylvania. As time went by, the brothers learned more and more about Italian cooking. After being with A & M Pizza for several years, Anastacio started talking with brothers Juan and Marco Antonio about living the “American Dream” and someday starting their own Italian business. In 2001, the “American Dream” came true when brother Anastacio opened E & T Italian Pizza & Restaurant. The restaurant took off and was a huge success. In 2003 Marco Antonio decided to venture out on his own and opened his restaurant, which was called De Marcos after himself. His menu was even bigger than brother Anastacio’s. Now living in Arizona, Juan saw that both of his brothers were succeeding in their business and decided he was going to have a go at the “American Dream” and opened his own Italian Restaurant with brother Evodio in Arizona. 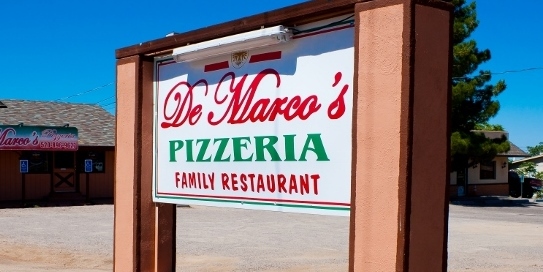 Keeping the family name, he opened the dorrs to De Marcos Pizzeria & Italian Restaurant in the town of Oracle, Arizona in 2005. With the same values, ideas and ingredients, brothers Juan and Evodio became a huge success in Arizona. Only several months after opening in Oracle, Juan and Evodio found another opportunity to open another Italian business in Globe, Arizona. In May 2006, De Marcos opened yet another Italian Pizzeria, with the same success. Brother Evodio left Oracle to continue running yet another Italian restaurant located at 1097 North Broad Street in Globe, Arizona. Juan, Evidio, Anastacio, Marco Antonio, and all of the De Marcos Family Restaurants would like to thank all of their employees and patrons for their success and being able to live the “American Dream”. Address: 1885 W. American Ave.